Do you like pottering about in the garden or growing your own plants? 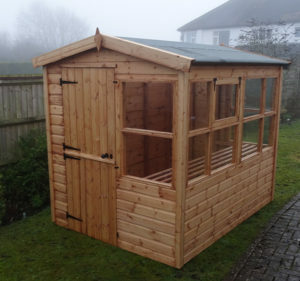 Then the Potting shed could be the building for you. With glazing on 3 sides to capture the extra hours of sunlight, with a shelf fitted below the windows for your seed trays & a ledge & brace stable door complete with lock & key that can go in either end, what more could you need? Constructed from tongue & groove shiplap on the four walls & tongued & grooved matching on the roofs and most floors (Heavy duty V313 Caberboard floors come as standard on any buildings 8’x8’ or larger). 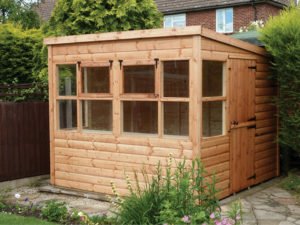 The building comes with pressure treated bearers on the floor, toughened glass fitted as standard& is externally treated with a spirit based preservative. 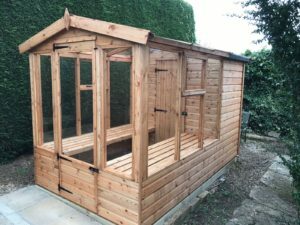 This is our traditional garden potting shed constructed from tongue & groove shiplap on the four walls & tongued& grooved matching on the roofs and most floors. 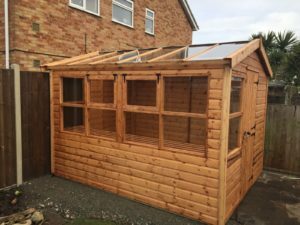 This building has all the main features of the Potting Shed, but in an Apex style with the added bonus of 1/2 of the roof being toughened glass to maximise the amount of sunrays that get to your plants. practical as well. & is externally treated with a spirit based preservative.